Archaeologica.org • View topic - Have mainstream scholars studied New England's megaliths? Have mainstream scholars studied New England's megaliths? This is why I'd like to have professionals examine this site. If it has lots of Amerindian artifacts, pillars from a loghouse, and then we find the stone row, it should be worth a real study. 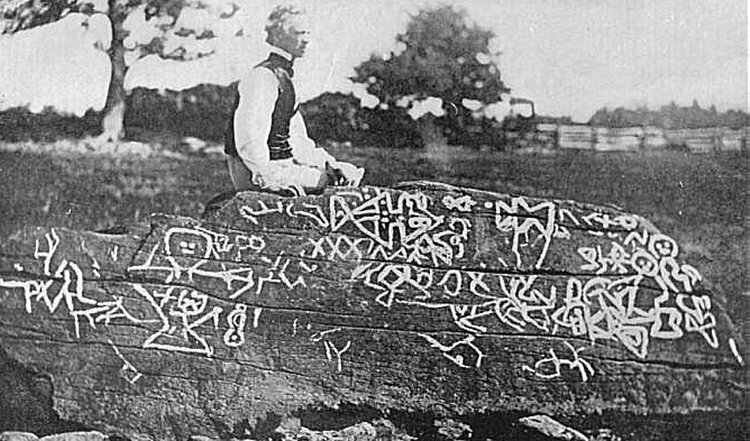 One of the archaeologists of the mainstream CNEA said that the Dighton Rock and Bellows Falls petroglyphs are certainly authentic Amerindian ones. FACT: Indians in New England in both pre- and post-contact New England did indeed use sacred sites featuring structures built of field stones. FACT: In Rhode Island there exists what has been called by some historians the Narragansett stony fort complexes. Queen's Fort, Wolf Rocks, Fort Ninigret, Great Swamp, Rolling Rock, and Shumunkanuc Fort are six examples. These sites were all either described historically as having been built using stone, or are still intact enough to this very day to actually see the stone structures. One of these forts -- Queen's Fort -- is on the National Register of Historic Places as a Narragansett site. 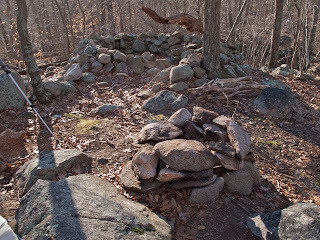 FACT: The historical evidence strongly suggests that Indians in New England built their sweat-lodges out of field stones. Often, they walled up the opening of a natural talus cave or rock shelter. There is no shortage of genuine Amerindian petroglyphs . Note how there is nothing like these at Gungywump . But none of the "facts " are evidence for Amerindians having built the the structures or provides a date for them . 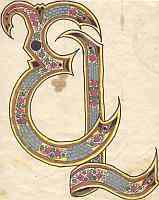 Looks like the author isn't too impressed with the letter either . Tiompan wrote: But none of the "facts " are evidence for Amerindians having built the the structures or provides a date for them . This is why I think a mainstream team of archaeologists should investigate the site - we know it is a mix of Amerindian and colonial settlement and we don't know who built which structures or when, or even if the builders were Dutch or English. It seems like a good place to have a real analysis done, don't you think? 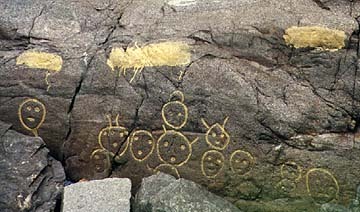 Tiompan wrote: There is no shortage of genuine Amerindian petroglyphs . The stone piles at Gungwamp are something like Amerindian stone piles elsewhere like at Queen's Fort, ie. piles of rocks in stone or circle formation. This is more reason for a real study to be done. The carving doesn't impress me. I enjoyed the map of the distribution of nations which you posted, but it is post contact. There were no "Mounbdbuilders" as one distinct people. Different peoples used earth as a construction material to build structures for a variety of different purposes. "mounds" are the ruins of those structures after the passage of a time of abandonment or being driven away. There were no "Adena" people; Adena is the name of a material culture. Based on the physical evidence, the people who produced those material remains were Andaaste. who adopted a general form of tribal alliance and laws of diplomatic interaction. I do not know if your statement about solar alignments is correct. I leave astronomical analysis to my colleague Fletcher Wilson, who is one of Ohio's best naked eye astronomers. The R Y haplogoup allele distribution is interesting, but probably useless, based on Hardachre's Observation. In Europe it has been found that mt DNA is about the only useful genetic diagnostic at this point of time in the development of genetic studies. then the northern distribution may make sense, but not the sub-Saharan African distribution. IN general keep in mind that ANY proposed genetic evidence must be consistent with the archaeological evidence. South America is quite a far distance from New England. It's hard to use that as a way to match up artifacts found in Northern US or Canadian sites. The "Solutrean " artifacts in question were found on the floor of the Chesapeake Bay, not in New England. came from South America to the Gulf Coast of North America. other than to note that there are a lot of nuts out there who try to build imaginary pre-Columbian European empires in the Americas. Fourth, a small deposit in the SE US, which I am not going to speak of. one of the finest collections of Old Copper Culture artifacts is in the hands of a private collector. Rako, you have to remember that the money for archaeological work in North America is in general very very limited. and get rid of them. as literal genocide is followed by cultural genocide. The first researchers' interest was mainly in how to make the native peoples fit into a literal interpretation of the Bible. A few argued that the natives were people, and deserved to be treated as such. Then came nuts of other religious varieties. Last edited by E.P. Grondine on Sat Oct 29, 2016 8:28 am, edited 1 time in total. The non cairns I was referring to were in your pic (with a marker site 10 ) that is between the pics of the "row " and the erratic . They are not like the "piles " and more like clearance . There are continual mentions of petroglyphs at the site .I have only seen pics of one , and it is far from impressive , and of course even if it was man made it could have been engraved at any time . Note how there is nothing like these at Gungywump. we do not know the dates for anything. which in themselves may be a natural formation used for ceremonial purposes. people are free to form any speculations they want to. "...Native American artifacts include arrowheads, stone flakes and pottery fragments." The same for the pottery fragments. No carbon 14 dates for the hearths. 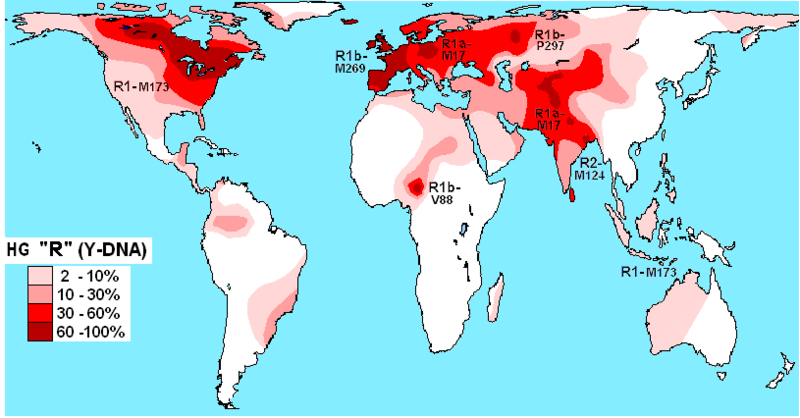 One reason is the question why there is so much more R1 DNA in north central canada than in Missouri, Texas, California, or Latin America, which were settled by R1B Euopeans? Second reason - R1b of Post Contact Europeans is not R1-M173. Anything particular in the article you want to show me? Giovanni Peebles explained in her book about vermont that the colonists liked to line up their buildings toward the sun to warm them up. Maybe there are other such mundane explanations. That's a different issue in Africa that demands its own line of research. Until then I don't see it debunking the existence of the R1B group as a real group. Rako wrote: South America is quite a far distance from New England. It's hard to use that as a way to match up artifacts found in Northern US or Canadian sites. Actually there is a theory of Mesoamerican influence on the Mound Builder Culture of the Mississippi, like how they got corn. One can see similarity in their artiefacts too. So if the Mesoamerican culture or even travelers could get to Cahokia in the Illinois-Missouri area..... one could post an offshoot or version going up to New England. Anyway, there was contact I think between Easter Island and South America before the time of John Cook's Arrival. The Mesoamericans could have gone north on their continent for exploration. I am not particularly advocating that theory though. Maybe it's hard to show the direction in which they went? OK, well Upton spent 400,000$ to buy the Upton Chamber, and Massachussetts or the Federal Government paid a ton of money and competed with a private NY organization to buy the land of Dighton Rock. Stonehenge USA probably makes alot of money from tourists. Late Woodland type of Iroquois pottery (1,200 to 1,600 AD) and cedar stokes were found at the 25 cm level within the eroded 'apron' soil. Early Woodland projectile points and kiln-dried, grass-tempered pottery, bones, and lithic tools were unearthed just within the shelter itself. Archaic times are represented by crude, dentate pottery tempered with sandy pebbles, projectile points, hammer stones and fired hearth stones. At the 35 to 50 cm level laboratory samples of charcoal match the known age of several unique projectile points (Susquehanna Points circa 500 to 1,500 BC), giving radio carbon dates as early as 770 BC. Well, it is good to know that better archaeology was done at that site. But all of this is far from my interests. be sure let me know. I expect evidence for a major one from coastal sites may be found about 1,000 BCE. See the end date for Canadian Red Paint. meant/means nothing to native peoples. But be sure to read my note on very very limited funding. You may enjoy spending your time trying to sot it all out as well. But all in all, I' myself would rather by toweling through tsunami deposits on Crete. Last edited by Ernie L on Mon Oct 31, 2016 4:19 pm, edited 1 time in total. New England elm collapse: 4650 BP-1950+570= 3270 BC Cause remains controversial. Decline in hemlock pollen in 45 New England lakes. The date of the disappearance is 4650 yrs BP with a standard deviation of 300 years. What do you think of the claim that there was a Vela Supernova that brightened the sky of Mesopotamia in 10,000-8,000 BC about the time that settlement agriculture began and it made an impact on their cultural development?